As demand for cash withdrawals at ATMs doubles or triples around the Vietnamese Tet holiday, banks are recommending customers use electronic payment or scan their cards at POS machines or use quick response (QR) codes instead of withdrawing cash at ATMs. 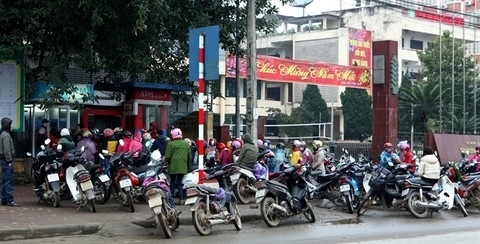 Hoang Anh Tuan, Vietcombank’s director of cash processing center, recommended customers use payment cards, credit cards or other forms of electronic transactions via internet banking, mobile banking and money transfers to minimise the need to withdraw cash. On the other hand, at the time before and during the Tet holiday, banks as well as goods and services suppliers have many promotions and discounts for customers when using cards. “This is also an opportunity for customers to save some costs,” Tuan told the Vietnam News Agency. When withdrawing money at ATMs, Tuan advised customers to withdraw money at locations where many ATMs are located or ATMs located at transaction offices as these ATMs will be restocked more quickly than those at other locations. To support customers when shopping or paying bills without using the cards or cash, Viet Nam Maritime Commercial Joint Stock Bank (Maritime Bank) recently introduced the payment feature using QR codes on mobile banking. Huynh Buu Quang, General Director of Maritime Bank, said that by paying via QR code, customers do not have to spend much time waiting and queuing; even when forgetting wallets or bank cards, customers still can pay bills at shopping points. In addition to the initiative from banks, to make transactions more secure and convenient users should guard their ATM card carefully, not give cards for others to use, avoid bending or scratching cards and change passwords frequently. If cards are swallowed or money is deducted from the account but no money is discharged, customers should wait until the ATM switches to standby transaction to prevent ATMs from discharging the cards or money after the customer has left. According to the latest statistics released by the State Bank of Viet Nam, the country has more than 127 million banking cards of all kinds, more than 17,300 ATMs and 260,000 POS machines. Despite the ceaseless increase in the number of ATMs and POSs, with the demand for cash withdrawal during the days near Tet, ATMs have become obstructed.